They seriously weighed up whether to pop a beer into cans for a couple of years before taking the leap as summer 2013/14 approached. And they must be glad they did. 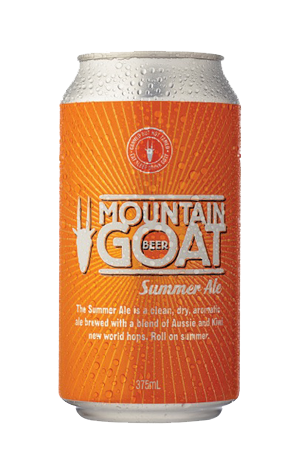 Goat's first venture into aluminium is a Summer Ale based closely on the Skipping Girl beer they'd trialled over a couple of previous summers in draught only form. The idea was to create an easy-drinking summer session beer - and give their staff something to drink at Meredith Festival - which resulted in this pale yellow passionfruit affair. The bitterness has been toned down from Skipping Girl, while Summer seems drier too. The other result – in other words whether the market would be ready for it – was emphatic, with the first batch produced for Goat at Independent Distillers / Asahi Premium Beverages disappearing almost overnight and requiring more batches to be brewed before the first say of summer was even upon us. The popularity has continued to grow with Summer becoming installed as a year round Goat release.